If you are looking for the ultimate Mexican vacation look no further. 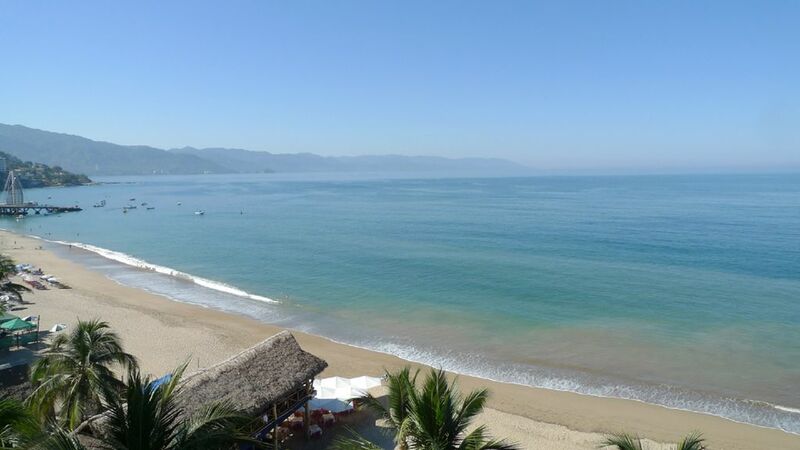 Our condo is located on the main beach in Old Town Puerto Vallarta, Playa Los Muertos. You will be in the center of everything and you'll never need to get in a taxi. The Malecon, beach, wonderful shopping and every type of restaurant you can imagine. They are all steps from our condo in the gated building, Villas Vista Del Sol. Go to sleep while listening to the ocean or just enjoy the ocean view from your bed in the master bedroom or the living room. You may never want to leave the balcony which has an incredible ocean view and mountain view! Watch the sunset from the rooftop after a swim in the rooftop pool. From the Pier hire a boat to go fishing or exploring for the day. Take the kids to El Eden and swing from the rope swing or slide down the rocks into the water. Our condo has two bedrooms. One with a king bed and bathroom and the other bedroom has 2 twin beds or can be made into 1 king bed with a bathroom across the hall. The condo is decorated with art from many local artists. Whether it is relaxing or an excitement filled vacation you want, it can be yours. Our condo can be your condo. I only rent Saturday to Saturday from November-March, min 7 night stay. My mother owns this condo and I manage it for her. My mother and I fell in love with Puerto Vallarta when I was studying Spanish here after college. She decided to come with me and take a few spanish classes herself! She rented a condo in Villas Vista Del Sol and loved it so much she bought a condo for herself. We have been coming back ever since! We love to go out to eat, shop, and go to the beach. We also rent a car sometimes and explore towns and beaches around Puerto Vallarta. We also usually end up at El Eden for a day because we love the rope swing! Both bathrooms have been remodeled recently. You can see and hear the ocean from the condo. Villas Vista Del Sol is located on Playa Los Muertos. It is directly in front of the building. There is also a restaurant at the bottom of the building looking onto the beach. It was a Beautiful condo! The property is decorated beautifully. The complex is superb and the location was perfect! My husband, two kids and I recently stayed for the second time at Villas Vista del Sol. We've stayed at a couple other places, but realized this is the best place if you want beachfront but less Malecon noise/traffic. Condo 711 was as beautiful as advertised. The listing advertised that the bathrooms had recently been remodeled, but really everything in the condo felt fresh and updated as well. The rain shower in the master bathroom was amazing. We didn't cook anything elaborate, but the kitchen appeared to be fully equipped - even plastic pitchers and cups if you wanted to take the party poolside. Thank you Alisha for opening your condo to us. Your welcome Kerri! It was a pleasure to have you at my condo. You were communicative and responsive and I appreciated that. Yes, you are right. We remodeled the bathrooms and kitchen recently, and the flooring and living room space were the most recent renovation. We are always improving our condo for our clients to have a nice condo to stay at while on vacation. Please contact me in the future if you want to return. I'd love to have your family stay again! Just got back to the states after a week in PV. This property was wonderful, safe and very convenient to everything. Kitchen had everything you could want but on vacation so no need for it. Couldn't tear myself away from the balcany the views were SPECTACULAR !! We stayed for a week and it was just what we needed. Walking distance to so many great restaurants, and shopping for the wife and kids. Sitting on the beach having buckets of beers with nacho's is a real vacation. Owner has remodeled unit over the years so the amenities are spot on. Roof top pool was kid friendly. Overall good time at this condo. 15 Years and Wouldn't stay anywhere else! We had a wonderful time. Terrific Location! Close to everything. Great roof top pool. Great views of the beach. I only rent Saturday to Saturday during November through April.